What’s behind the durian fruit’s notorious stench? Most people who have tried durian either love it or hate it. 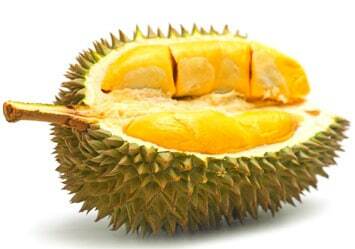 The fruit’s yellowish flesh is sweet and custard-like, but it comes with an overpowering stench of garbage. Scientists studying the unique fruit have now analyzed a set of 20 stinky and fruity chemical ingredients and found that a mere two compounds can re-create the overall smell. Their findings appear in ACS’ Journal of Agricultural and Food Chemistry. Native to southeast Asia – where the fruit is considered a delicacy, but also banned from some public spaces due to its odour — its appeal has spread to Westerners who relish trying distinct foods from around the world. Scientists interested in the fruit have identified several compounds that contribute to its smell, which has been said to reek of gym socks, garbage and rotting meat. Curious to better understand the complex scent, Martin Steinhaus and colleagues parsed the odour compounds further. The researchers calculated the “odour activity values” of 19 of the durian’s smelly compounds to see which ones were the most potent. Among the strongest were compounds that smelled of fruit, rotten onion and roasted onion. These were followed by chemicals with strong notes of cabbage and sulphur. Further experimentation found that putting just two specific compounds together — fruity ethyl (2S)-2-methylbutanoate and oniony 1-(ethylsulfanyl)ethanethiol — effectively resembled the fruit’s entire set of odoriferous and fragrant compounds.